Story Time. Wait until bedtime, slip on the PJs and warm up the hot chocolate, then invite everyone—especially the kids—around the fireplace. 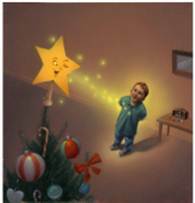 Re-kindle the magic of yesteryear with Story Time that tells a dramatic, kid-relevant story—a story that shares the real story of Christmas through the eyes of Little Star. 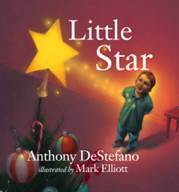 This new children’s book from Author Anthony DeStefano tells the story of one little, insignificant Star and how he becomes more than significant by ushering in a newborn King named Jesus. AN EXTRA BONUS! SEE PAT BOONE read the story at http://tinyurl.com/littlestar, , or get your own copy. More at www.anthonydestefano.com.